Last week, we shared the exciting news that18-year-old dressage rider, Ayden Uhlir, had become the first equestrian athlete to be sponsored by sportswear superpower Nike. The news came as a surprise to many given Uhlir’s youth and discipline of choice. With huge names like Tiger Woods, LeBron James, and Serena Williams sporting the commercial-savvy swoosh, in sports like golf, basketball, and tennis, many wondered why Nike would choose young Uhlir to lead the charge into the world of equestrian sport. Undoubtedly, the best person to answer that question is Uhlir herself. Luckily, the equestrienne reached out to EquineChronicle.com this week expressing an interest to share her experience with our readers! Uhlir’s journey began at the age of five when her mother allowed a brief trip around the pen on a “very old horse” aptly named “Minimum Risk.” Like many young riders, Uhlir was hooked from that first time in the saddle. Four years ago, Uhlir’s equestrian career received a huge boost when she was selected to participate in the first ever Robert Dover HorseMastership Week. The experience of mingling with riders and trainers like Jan Ebeling, Tina Konyot, Lendon Gray, Robert Dover, Courtney King-Dye and many others was life-changing. Three years ago, Uhlir met her equine soulmate in the form of her “dream horse,” Sjapoer. In 2012, the duo won the Junior National and North American Championship. The pair returned in 2013 and won the Young Rider National and North American Championship, a back-to-back feat never before accomplished by a young rider. In 2012, at the age of 16, Uhlir left her home in Texas and moved to Washington State to train with USEF National Youth Coach Jeremy Steinberg. In January of this year, Uhlir moved to Southern California to train with Olympic bronze medalist Christine Traurig. Uhlir still rides her beloved Sjapoer, but she’s also looking for a Grand Prix horse to compete with in the FEI U25 Grand Prix. Many people wonder why Uhlir chose to approach Nike, of all companies, to obtain her first major sponsorship and how she managed to close the deal. The young rider spoke candidly about the experience. Uhlir also loves interacting with fellow riders and fans by way of her blog, The Dressage Spot, where she shares information about the sport of dressage, riding tips she’s picked up along the way, and fun accounts of her travels. Especially for our EquineChronicle.com readers, she has given her top five tips for breaking through barriers and making contacts in the horse industry. Let’s recap. Although many riders in the performance horse industry are prohibited from utilizing sponsorships, Uhlir’s advice can apply to making contacts within the horse industry and developing relationships that can advance your equestrian career. 1. Think about your personality. Match your strengths with others who value the same. 2. Keep contact, even with little things. 3. Think outside the box and be open to new ideas. Uhlir is the first to acknowledge that she wasn’t able to attain this level of success on her own. Like all equestrians, no matter the discipline, an important part of the team is their equine partner. 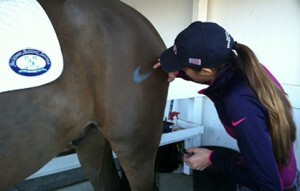 The day after receiving the exciting news that she had snagged a Nike contract, Uhlir celebrated with her horse by giving him a Nike “brand” of his own. A big thanks goes to Uhlir for taking time out of her busy schedule to answer our questions. We wish her the best of luck in the future.